In his lifetime, he recorded over 26,000 songs (a Guinness Book World Record), appeared in over 600 movies and was given damn near every award under the sun in his 40-year career as a leading force in the Indian music scene. They didn’t call him, “the Voice of God” for nothing. I, like most Americans, had no idea who India’s greatest playback singer (a singer whose songs are recorded for films) was until I saw the 2001 Terry Zwigoff film, “Ghost World”. In the film’s opening credits, the Mohammed Rafi tune, “Jaan Pehchan Ho” is featured predominately. Featuring blaring, 60’s distorted guitar over an unrelenting Indian beat, Rafi sings with relentless charisma as he howls in a tantalizing display of vocal prowess. The tune is catchy beyond reason. See (and listen) for yourself. After watching the film, I immersed myself in all things Rafi. Born December 24th, 1924 in the Punjab province of Pakistan, Rafi gave his first public performance at the age of 13. He and his brother Hameed had intended to see Bollywood’s first reigning superstar, K. L. Saigal, but when the singer refused to perform due to electrical problems at the venue, the young singer made his debut when his brother coaxed the show’s frantic promoter into letting him sing to entertain the restless crowd. Witnessing the performance was noted Indian composer Shyam Sunder who was impressed enough with the impromptu recital to invite him to Bombay. Though his recording career started in 1944, his rise to fame came when Naushad Ali, one of the most famous music composers of the day, had Mohammed sing for the 1952 film, “Baiju Bawra” when his first choice Talat Mahmood was reportedly found smoking (exactly what he was smoking is not known). After that, the influential musician only used Rafi when he needed a male voice. This close association led to him being used by other preeminent composers such as O.P. Nayyar, Shankar Jaikishan and Sachin Dev Burman and his voice appeared in a dizzying amount of films throughout the 1950’s to his death in 1980. Add to this an extensive regiment of live performances and the notion that James Brown is the hardest workingman in show business suddenly sounds quaint. With all due respect to Soul Brother Number One, but after all is said and done, Mohammed Rafi is only man that can truly wear that crown. Despite his immense output, finding the man’s music can be hard, but not impossible. There are several excellent Bollywood compilations that feature his work (notably, “Doob Doob O’Rama” on Normal Records) along side other legendary Indian artists such as Lata Mangeshkar (with whom he often sang duets with), Kishore Kumar and Asha Bhosle. But the crown jewel of the man’s accomplishments is collected on the 2-disc compilation appropriately entitled, “The Golden Collection” (Saregama). That one never stays too far from my CD player. I found it in an Indian store in New Jersey soon after seeing, “Ghost World” when I was trying to find any and all Indian Bollywood music I could get my hands on. I kick myself to this day because they had a 10 CD box set of the man’s work for 50 bucks, but, as the story usually goes, I didn’t have the enough disposable income at the time to purchase it. “Ye Duniya Ye Mahfil Mere Kaam Ki Nahi” from the movie, “Heer Ranjha” (1970). “The Golden Collection” features many of the hits he had with the above-mentioned composers and shows that Rafi was more than capable of handling everything from sad laments, patriotic tunes to hot and sweaty romantic numbers. His voice floats over the compositions like a snake charmer wheedling each tune with a precise though never obvious vocal turn. Tunes such as 1964’s evocative “Rang Aur Noor Ki Barat” and 1970’s slinky, “Yah Deniya Yeh Mehfil” find Rafi at the height of his powers. Both perfectly capture his clarity of tone and unique phrasing. The music is rich in texture full of swirling tablas, sitars, and flutes either floating in the background or punctuating verses with otherworldly resonance. It is strangely beautiful music. Hypnotic, soothing, and captivating, it becomes readily apparent why he had legions of fans throughout his long and storied career. “Rang Aur Noor Ki Baraat Kise Pesh Karun” from the film, “Ghazal” (1964). 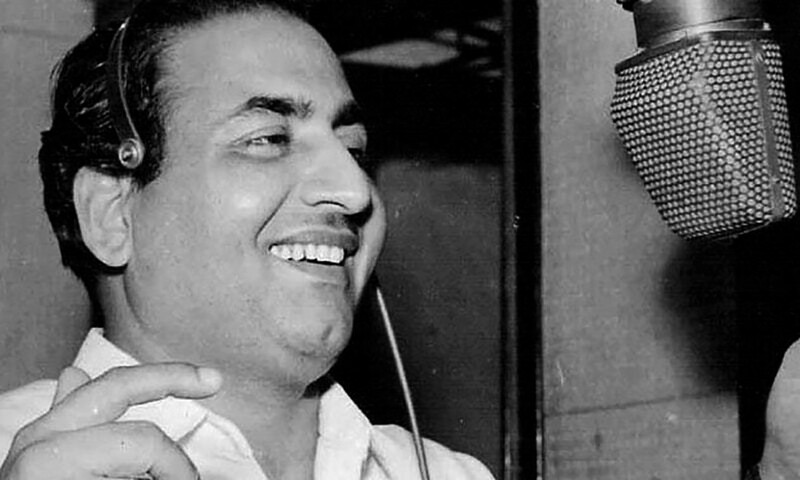 To this day, Mohammed Rafi’s indelible influence can be heard in the current crop of Bollywood singing stars. He is revered as a national treasure and since his death in 1980; there have been countless concerts and celebrations to honor the man, the myth and the legend whose indomitable spirit and humanitarian concerns continue to endear him to millions. Notoriously humble, Pakistani composer Nisar Bazmi, whose career was greatly enhanced with his work with the beloved star, said of Rafi that, “he always gave without thinking of the returns”. All you have to do to realize the man’s stunning attributes is to listen to his music.